This video is missing Black Friday footage from Walmart. "Fight Right" is the new single from Rabbits' recently released album, Bite Rites. The band also apparently covered Minor Threat and Black Flag for a Record Store Day curated flexi single called, Flexihead. 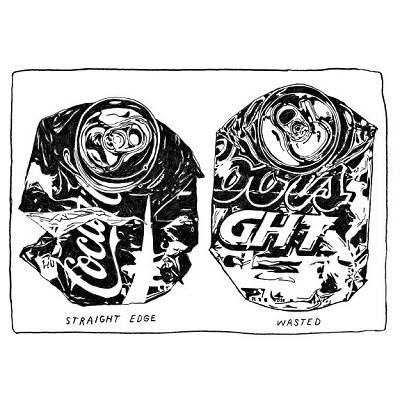 Renditions of "Straight Edge" and "Wasted," perfectly contradictory, were featured. Info comes courtesy of Earsplit PR. Portland's caecothrophic collective RABBITS have excreted their very first hare-raising video to help ruin your day, constructed for the rampant skronking riffage of “Fight Right,” the second track off from their recently birthed Bites Rites LP. The cinematic mayhem was completed by Wes Johnson of Good to Die Productions -- the film team responsible for labelmates Deadkill’s "Oh God Help You" video -- utilizing early live footage shot by the fourth Rabbit Daniel Abell and RABBITS’ own warped “us-versus-them” concept. Unleash the visual chaos of “Fight Right” and more from the RABBITS vermin RIGHT HERE. For this year’s Record Store Day these racket practitioners dropped a two-song flexi postcard thing called Flexihead, busting out conflicting covers of Minor Threat’s “Straight Edge” and Black Flag’s “Wasted” in the relentlessly blaring noise-infested RABBITS rage. Portland Mercury’s music editor issued a short blog post, highlighting the hand-written love note from the band stating "Enjoy your desperate attempts to make this thing play."